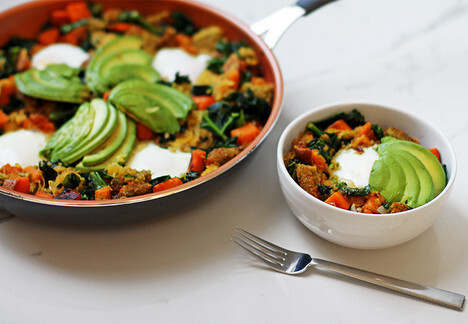 A flavor packed veggie skillet perfect for any breakfast for dinner! 1. In a nonstick skillet over medium-high heat, add 1 tablespoon of vegetable oil and sauté onions, garlic and kale for 5-6 minutes. Remove from pan, reserve. 2. Return skillet to medium-high heat and add remaining tablespoon of oil, spaghetti squash and sweet potatoes. Sauté for 6-7 minutes. 3. Cut each burger into 9 pieces and add to the pan. 4. Stir in soy sauce, pepper and sautéed vegetables. 5. Make 4 holes in the mixture and crack an egg into each. Cover and continue to cook for 4-5 minutes or until desired doneness of eggs is reached. 6. Top with sliced avocado. Enjoy!